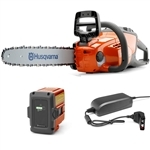 Husqvarna 120i Battery Powered Chainsaw With 14" Bar and Chain 967098102 Battery and charger included. Mid-sized X-Torq® tree care saw. This Husqvarna top handle chainsaw is lightweight and powerful for pruning in parks as well as vineyards and fruit orchards. The low weight and well-balanced saw body makes it very easy to work with. Call for price at (888) 208-2088. Efco’s MT 5200 mid-size chainsaw was designed for the more demanding user. From farming to tree service to frequent firewood cutting, the MT 5200 chainsaw provides the quality that you need. Engineered with legendary Italian design and backed by industry leading 2 year commercial and 5 year consumer warranties. Created with the highest quality materials and ingenuity, Efco is power you can trust. The T536Li XP arborist battery powered chainsaw has excellent ergonomics, high performance and high chain speed. It's designed for professional users who want a lightweight, high performing, and extremely easy-to-use top handle electric cordless chainsaw for tree maintenance. Battery and charger not included. The Husqvarna 455 Rancher Chainsaw is the ideal 20" chainsaw for landowners and part-time users who require a high powered, heavy-duty and responsive workmate for all cutting conditions. It combines the best characteristics of its predecessor with new, facilitating technology and ergonomics. FREE SHIPPING! 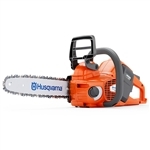 We carry the Husqvarna 460 Rancher forestry chainsaw with a durable 18-inch bar. The 460 18" chainsaw comes equipped with the X-Torq® engine designed to deliver increased fuel efficiency the lowest emissions in its class. The ergonomic handles and slimmed-down design make it easy to use without causing sore muscles or fatigue. The 460 Rancher has Smart Start® technology and an air purge system that allows for quick, easy cranks. The oil and air filters, oil pump, and chain tensioner are all easily accessible for quick adjustments on the fly. The Husqvarna 460Rancher with 18-inch bar is lightweight, versatile, and built to last. 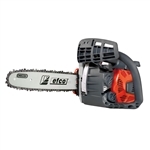 Order this powerful chainsaw now to take advantage of our affordable prices & fast, free shipping now or contact our experts for help finding the right chainsaw for your needs. Husqvarna 545 is developed for demanding work by contractors and land owners. The saw has a ground breaking design and is loaded with raw power for efficient operation. Our unique X-Torq® engine technology provide more power where you need it, up to 20% less fuel consumption and 75% less exhaust emission. FREE SHIPPING!! We sell the Husqvarna 460 Rancher 20” bar chainsaw perfect for professional loggers and residential homeowners. The 460 XP 20” chainsaw comes with the powerful X-Torq engine that’s built to deliver increased power and fuel efficiency, as well as greatly reduced emissions compared to other chainsaws in its class. The 7° offset front handle and low vibration technology (LowVib®) reduce the strain that can cause fatigue and allows for easier, cleaner cutting. The choke/stop control and Smart Start® systems ensure the Husqvarna 460 Rancher starts and stops quickly with minimal effort. The air injection system prevents debris from entering the internal mechanism and removes any particles from reaching the air filter. The Husqvarna 460 Rancher 20” bar chainsaw is lightweight, ergonomically designed and built to last. Loaded with all the latest features, this chainsaw is perfect for all types of applications. Buy now to take advantage of our fast and free shipping. A robust all round 24" chainsaw, ideal for demanding cutting jobs where more power is required for a longer guide bar. Equipped with X-Torq® engine with high torque over a wide rpm range. The saw’s body is ergonomically designed allowing for easy handling of the saw’s power. Further features of the Husqvarna 460 Rancher chainsaw include Smart Start®, Air Injection, LowVib® and combined choke/stop control. FREE SHIPPING! *Ask us how to extend your warranty! The Husqvarna 465 Rancher is a powerful chainsaw equipped with the most advanced features. The X-Torq® engine delivers improved fuel efficiency while reducing emissions and the LowVib® system improves stability and maneuverability for the smoothest cutting in its class. Smart Start® technology makes the 465 Rancher the easiest to start and the Inertia activated chainsaw brake safe by reducing kickback from the engine. The air filter, oil filter, and chain tensioner are all easily accessible for making fast adjustments on the fly. The air injection system purges debris from the internal mechanism before it can damage or clog the air filter. All of these features make the Husqvarna 465 Rancher with a 20-inch chainsaw bar the most versatile, dependable, and trusted chainsaw by professional contractors and experienced homeowners alike. 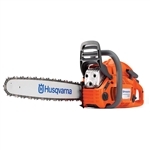 Buy it now to enjoy our affordable prices and fast, free shipping or contact our experts for help finding the right Husqvarna chainsaw for you. 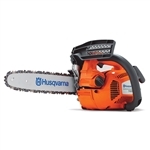 We carry the Husqvarna 465 forestry chainsaw with a 24-inch bar. This powerful chainsaw is equipped with Husqvarna’s X-Torq engine designed to provide increased fuel efficiency and greatly reduced emissions when compared to other chainsaws in its class. The 465 XP 24” chainsaw comes with an ergonomically designed front handle grip with a 7° offset angle and LowVib® technology that cuts back on vibrations in order to reduce stress on the arms and allow for more efficient cuts. The inertia activated chain brake reduces the possibility of kickbacks, and the combined choke/stop controls allow for easier starting and stopping. The Husqvarna 465 Rancher 24” bar chainsaw is powerful, versatile and built to last. Husqvarna is trusted by the most experienced professionals in the field who demand the very best from their power tools, and the 465 Rancher is designed for even the toughest jobs. Buy now to take advantage of our fast and free shipping. 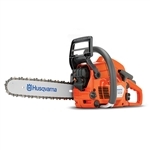 We carry the Husqvarna 465 Rancher chainsaw with a 28-inch chainsaw bar. This powerful chainsaw comes equipped with Husqvarna’s X-Torq® engine, engineered to provide decreased fuel consumption and exhaust emissions while increasing power and speed. The 465 Rancher chainsaw has a centrifugal air cleaning system that removes chunks of wood, sawdust and debris before it reaches the air filter, improving engine life and reducing filter cleanings and replacements. The Husqvarna 28-inch chainsaw bar is long enough to handle the toughest jobs, and the entire chainsaw only weighs 13.45 pounds. Along with the ergonomic handle, this lightweight, heavy-duty chainsaw allows you to work longer and smarter until the job is done. The Husqvarna 465 Rancher is powerful, versatile and built to last. Buy the 465 Rancher chainsaw now to enjoy our great prices and free shipping, or contact our experts for help finding exactly what you need. We have the Husqvarna 18" forestry chainsaw designed for commercial and residential use. The 550 XP 18" chainsaw bar is sharp enough to cut through thick trees and brush, and the powerful X-Torq® engine delivers increased power and fuel efficiency, as well as reduced emissions over other chainsaws in its class. This is a lightweight, 12.5-pound chainsaw with a 3.75HP engine powerful and durable enough to handle hours of continuous use. The compact frame and ergonomic design make the Husqvarna 18” chainsaw easy to use and perfect for all types of applications. The Husqvarna 550 XP 18” chainsaw is versatile, lightweight and built to last. The chainsaw is comfortable in the hands and delivers unparalleled performance. The new and innovative features provide the power and efficiency you need to get the job done fast, and the 18” bar is the perfect length for most any job. Buy now to enjoy our fast and free shipping, or contact us for more information. Efco’s MT 6500 professional chainsaw was designed for the more demanding user. From logging to tree service to frequent firewood cutting, the MT 6500 provides the professional cut that you need. Engineered with legendary Italian design and backed by industry leading 2 year commercial and 5 year consumer warranties. Created with the highest quality materials and ingenuity, Efco is power you can trust. 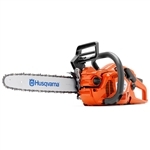 We carry the Husqvarna 20" forestry chainsaw designed for commercial loggers and residential landowners. The innovative 20" Husqvarna chainsaw blade is sharp enough to easily cut through thick trees and long enough to handle the toughest jobs. Air injection prevents debris from clogging the air filter, and the powerful X-Torq® engine delivers increased fuel efficiency and reduced emissions compared to any other chainsaw in its class. The 550 XP 20" chainsaw is lightweight and ergonomically designed to provide a comfortable grip and makes cutting from any angle a breeze. The Husqvarna 20” forestry chainsaw is versatile, compact and built to withstand the most rugged environments. Trusted by the most experienced professionals in the field, this Husqvarna chainsaw combines all the best features into a single powerful tool. 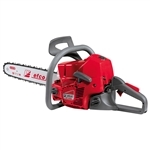 Buy the 550 XP 20” chainsaw now to take advantage of our fast and free shipping, or contact us for more information.